Facilitated by Georgina Robinson, Ph.D. and Lynn Savoie, M.A., this group will provide an introduction to Mindfulness practices. 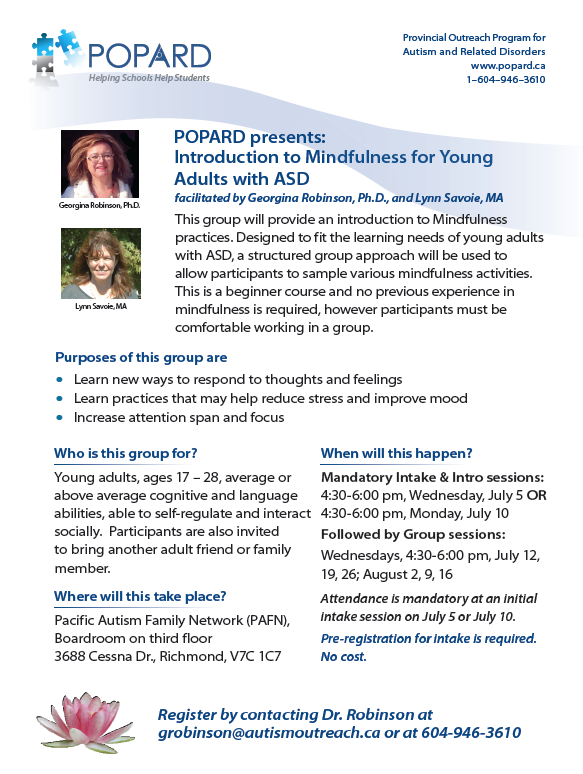 Designed to fit the learning needs of young adults with ASD, a structured group approach will be used to allow participants to sample various mindfulness activities. This is a beginner course and no previous experience in mindfulness is required, however, participants must be comfortable working in a group. No cost. Increase attention span and focus. Pre-registration for intake is required. Attendance is mandatory at an initial intake session on July 5 or July 10. This entry was posted on July 5, 2017 by Events Manager.